Arthritis can affect the joints in your hips, knees, hands, and other parts of your body. It is characterized by inflammation and debilitating pain which can interfere with your daily activities. Luckily, there are several home remedies for arthritis pain relief which can treat your condition effectively. Other symptoms of arthritis are redness and swelling around the joint, stiffness, and limited joint movement. The pain, on the other hand, can vary from mild to severe. The most common types of arthritis are rheumatoid arthritis, osteoarthritis, psoriatic arthritis, gout, and fibromyalgia. Even though the first choice for most arthritis sufferers is taking a pain killer to relieve their suffering, these medications are only a temporary solution that comes with certain side effects. Luckily, you can reduce your pain with home remedies which are completely natural and safe. 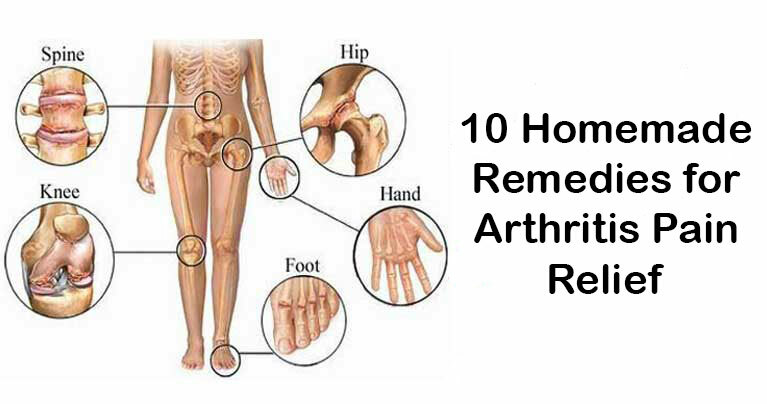 Along these home remedies for arthritis, you should also try to stay physically active. This vinegar helps reduce joint pain thanks to its high levels of potassium, magnesium, calcium, and phosphorus. What’s more, it helps remove toxic buildups in connective tissues and joints. Add a teaspoon of apple cider vinegar and another one of honey in a cup of warm water. Stir and drink on an empty stomach. This solution has alkalizing effects. The anti-inflammatory properties of ginger make it an excellent choice for arthritis pain relief. Dry grind a mix of six teaspoons of caraway seed powder, six teaspoons of dried ginger, and three teaspoons of black pepper powder. Consume ½ a teaspoon of this combination along with water, three times a day. Also, you can apply ginger oil on the affected area to relieve pain, stiffness, and inflammation. As an alternative, you can add raw ginger to your daily diet. This will improve your blood flow. Use mustard oil to massage the affected area and reduce the pain and inflammation caused by arthritis. The oil will boost your blood circulation. Rub some warm mustard oil on the affected area. Use plastic wrap and then a warm towel to cover the joint. If your joint is swelled, add an onion juice to the mustard oil in equal ratio. Repeat this procedure every night before bed time. In addition, you can use eucalyptus oil to reduce your joint inflammation. Combine it with wintergreen oil and use it to massage your painful joint. Afterward, you don’t have to cover your joint with anything. Consume turmeric regularly to help you relieve your joint inflammation. This is because of the active compound in this plant, curcumin, which provides strong anti-inflammatory properties. Turmeric is especially great when used as a home remedy for rheumatoid arthritis. Prepare turmeric juice or turmeric milk and drink every night before bedtime. To make turmeric milk you need a glass of warm milk and a teaspoon of turmeric powder. Just stir in the powder into the milk and your golden milk is ready. Another option is to take turmeric supplement in the form of capsules (500-1,000 mg). Having a highly acidic nature in the body can cause arthritis. Therefore, balancing the pH levels is useful in the treatment of this joint condition. A good way to regulate your body’s pH levels is using the magnesium-rich Epsom salt. This is why Epsom salt is one of the most effective home remedies for arthritis. Add equal amounts of lemon juice and Epsom salt to ½ a cup of warm water, and drink a teaspoon in the morning, and another one before bed. As an alternative, soak in a warm Epsom salt bath. Add 2 cups of the salt in your bathtub filled with water. Thanks to its antioxidant and anti-inflammatory properties, cinnamon can relieve your horrible joint pain due to arthritis. Prepare a solution by mixing a cup of warm water, one and a half teaspoon of cinnamon powder and a tablespoon of honey. Take this drink as a first thing in the morning, for several days. Also, you can mix some honey and cinnamon to form a paste. Use it to massage your aching joint. Fish oil contains omega-3 fatty acids which have strong anti-inflammatory properties. This omega-3s help relieve joint pain. Drink 1-2 teaspoons of fish oil a day. Another option is to take it as a supplement on an empty stomach. This will improve your morning stiffness. Besides fish oil, you should also consume other omega-3-rich foods like flax seeds and cold-water fish. The high mineral content of alfalfa and its ability to regulate the body’s pH levels make it a great herb for arthritis treatment. Boil a cup of water and add one teaspoon of alfalfa seeds. Cover and let them simmer for around half an hour. Then, strain the mixture and drink the liquid two times a day. Do this every day for 2-3 weeks, and you’ll successfully reduce your joint inflammation. As an alternative, take alfalfa capsules on a daily basis. The potassium- and magnesium-rich cherries help relieve arthritis pain. Potassium helps reduce inflammation, whereas magnesium eliminates pain. To obtain the useful properties of cherries in the treatment of arthritis, consume 8-10 cherries a day, regardless if they are fresh, frozen, or canned. Also, you can make a cherry syrup and drink it every day for few months. To prepare a homemade cherry syrup just boil a fair amount of cherries in some water. Borage seed oil is another excellent home remedy for arthritis pain relief. It possesses anti-inflammatory properties strong enough to reduce your arthritis symptoms. To treat your tender and swollen joints, apply some borage seed oil on the painful area and gently massage. Moreover, you can consume a teaspoon of this oil on a daily basis to relieve your arthritis pain. However, don’t eat borage seeds or any other parts of the herb. Try these home remedies for arthritis pain relief one at a time, and see what works best for you. Also, keep in mind that regular physical activity is extremely helpful for the treatment of arthritis.